I abhor licorice candy. Maybe it’s the chewy, stick-to-your-teeth texture or the intense flavor. Maybe it’s that Milk Duds and Sugar Babies always won out at the Malco Theatre concession stand of my childhood. The idea of black candy also freaked me out a bit, but I didn’t like the red version any better. Fennel, on the other hand, is a different story. Even with the same licorice flavor, albeit milder, I simply adore fennel. The delicate flavor in a crisp, fresh vegetable doesn’t offend me at all. Go figure. I’m happy eating it raw, sauteed, or braised as a side dish. It also contributes beautifully to soups and stews. Apple and fennel make great bedfellows, so today’s post features a salad made with the crunchy companions and topped with a shallot vinaigrette. As I’ve said before, presentation always makes food more exciting so I decided to serve this salad in Parmesan cheese bowls. I’ve made Parmesan crisps with this salad in the past and the concept for the bowls is very similar. The bowls can be made in different ways, including forming the cheese on the bottom of an inverted ceramic or glass bowl. This technique produces very uniformly shaped bowls. I prefer the more free form shapes which result from using a glass. When making the bowls, use a non-stick skillet. Coat the pan with cooking spray and heat over medium high heat. Sprinkle the cheese over the bottom of the skillet and cook for approximately 45 seconds to one minute or until cheese is bubbling and starts browning around the edges. When the cheese has started browning, remove the skillet form the heat and let sit for 15 to 30 seconds or until the cheese stops bubbling. With a small rubber spatula, loosen one side of the cheese and, working very quickly, lift the cheese with the spatula and your fingers and drape over a glass. Let the cheese cool over the glass for about two to three minutes. When the cheese is set, carefully lift the bowl off of the glass and set aside. These Parmesan bowls can be made ahead of time and will keep for several hours. This refreshing salad in an elegant presentation makes a great starter for a dinner party and will impress your guests. 1. Coat a 10 inch non-stick skillet with cooking spray and place on cook top over medium high heat. 2. Sprinkle 1 cup of Parmesan cheese over bottom of skillet, covering the edges with less cheese than the middle. Cook for about one minute or until cheese is bubbling and the edges are starting to brown. 3. Remove from heat for about 15 to 30 seconds. With a small rubber spatula lift the edge of the melted cheese and working quickly and carefully, lift the sheet of melted cheese with your fingers and drape over the top of a glass. Let sit for about two to three minutes to cool and set. 4. Carefully remove the cheese bowl and set aside. 5. Repeat process to make three more bowls. 1. Whisk together vinegar, mustard, honey, salt, pepper, and shallots. 2. Continue whisking and slowly add olive oil until emulsified. Set aside. 1. Thinly slice fennel bulb, preferably with a mandolin. If you don't have a mandolin, Cut the bulb in half and place cut side down before slicing. 2. Peel, core, and thinly slice apple. 3. In a small bowl, mix fennel, apple, and chopped fennel fronds. Add dressing to taste. 4. In another bowl, add dressing to taste to salad greens. 5. 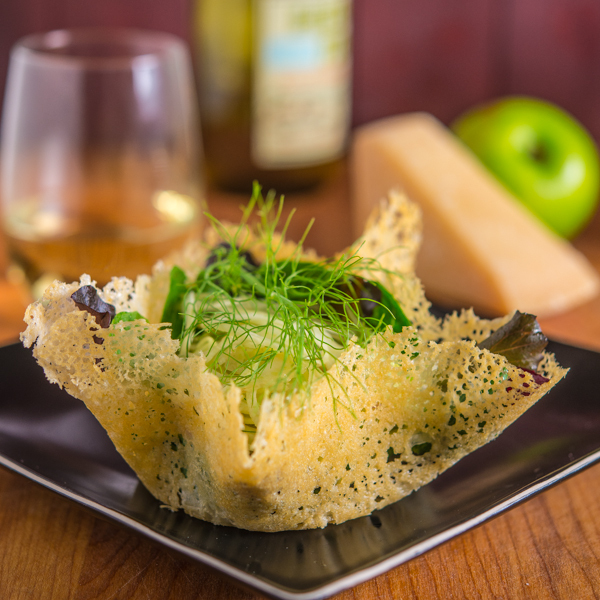 Carefully place salad greens in Parmesan bowls and top with fennel and apple mixture. Garnish with a piece of fennel frond. Very innovative. Thanks for sharing. This is such a fancy idea and love the fennel, hate the licorice..The salad looks so fresh. I don’t like licorice either, but love fennel and usually enjoy most foods with an anise flavor. Weird. Anyway, really nice dish – you’re so right that fennel and apples play well together. Nice vinaigrette, too. Great salad – thanks. How clever is that! So glad you showed me how to do it. I love licorice (Good & Plenty Candies), but have the opposite dislike that you do. When I was in my early twenties, and a bit stupid, I drank a little too much Ouzo, with beer chasers. Stupid, yes, but I was trying to be “cool” with the crowd. Anyway, I was so blitzed, my BFF drove me to her place where I had room spins and….shall we say, the worst hangover of my life. Ever since that time, Fennel reminds me of Ouzo. The only dish that I can handle, so far, is Ina Garten’s Fennel and Potato Au Gratin. However, this salad just might help me to change my mind. It sounds “clean” and love the idea of the apples. Beautifully photographed, as always. WOW these are beautiful and so delicate!!! Thanks for the great recipe! Can’t wait to try it out.